Introducción. El cáncer de mama es un problema de salud pública a nivel mundial y en Santander es la primera causa de morbimortalidad por cáncer en mujeres. Todo cáncer se considera una enfermedad genética y las mutaciones en los genes BRCA confieren un riesgo de 60% a 80% para el cáncer de mama. Este estudio consistió en buscar las dos mutaciones BRCA1 más frecuentes según la base de datos Breast Cancer Core Information. Objetivo. Determinar la presencia de mutaciones específicas (185delAG, exón 2, y 5382insC, exón 20) en el gen BRCA1 en mujeres con cáncer de mama heredo-familiar, atendidas en los diferentes servicios de oncología de Bucaramanga, Colombia. Materiales y métodos. La muestra incluyó 30 pacientes, de las cuales se obtuvo un consentimiento informado, un cuestionario dirigido y sangre venosa para los estudios moleculares. El análisis molecular se realizó mediante PCR-mismatch, para introducir o eliminar sitios de restricción, y digestión enzimática (HinfI o DdeI). Resultados. No se detectaron dos de las mutaciones más frecuentes en el gen BRCA1 en las 30 pacientes estudiadas. Conclusión. Se requieren más estudios en la región que abarquen la tamización de la totalidad del gen BRCA1, para hacer una mayor contribución al conocimiento de la epidemiología molecular del cáncer de mama en Bucaramanga, Santander, Colombia. 1. Parkin DM. International variation Oncogene. 2004; 23:6329-40. 2. Stewart SL, King JB, Thompson TD, Friedman C, Wingo PA. Cancer mortality surveillance--United States, 1990-2000. MMWR Surveill Summ. 2004;53:1-108. 3. Hormiga C, Rodríguez L, Uribe C. Análisis de la situación de las enfermedades neoplásicas en Santander. Revista del Observatorio de Salud Pública de Santander. 2006;2:4-30. 4. Miki Y, Swensen J, Shattuck-Eidens D, Futreal PA, Harshman K, Tavtigian S, et al. A strong candidate for the breast and ovarian cancer susceptibility gene BRCA1. Science. 1994;266:66-71. 5. Wooster R, Bignell G, Lancaster J, Swift S, Seal S, Mangion J, et al. Identification of the breast cancer susceptibility gene BRCA2. Nature. 1995;378:789-92. 6. Easton D, Ford D, Peto J. Inherited susceptibility to breast cancer. Cancer Surv. 1993;18:95-113. 7. Marcus JN, Watson P, Page DL, Narod SA, Lenoir GM, Tonin P, et al. Hereditary breast cancer: pathobiology, prognosis, and BRCA1 and BRCA2 gene linkage. Cancer. 1996;77:697-709. 8. Ford D, Easton DF, Stratton M, Narod S, Goldgar D, Devilee P, et al. Genetic heterogeneity and penetrance analysis of the BRCA1 and BRCA2 genes in breast cancer families. The Breast Cancer Linkage Consortium. Am J Hum Genet. 1998;62:676-89. 10. Bar-Sade RB, Kruglikova A, Modan B, Gak E, Hirsh-Yechezkel G, Theodor L, et al. The 185delAG BRCA1 mutation originated before the dispersion of Jews in the diaspora and is not limited to Ashkenazim. Hum Mol Genet. 1998;7:801-5. 11. Diez O, Osorio A, Robledo M, Barroso A, Domenech M, Cortés J, et al. Prevalence of BRCA1 and BRCA2 Jewish mutations in Spanish breast cancer patients. Br J Cancer. 1999;79:1302-3. 12. Neuhausen SL, Mazoyer S, Friedman L, Stratton M, Offit K, Caligo A, et al. Haplotype and phenotype analysis of six recurrent BRCA1 mutations in 61 families: results of an international study. Am J Hum Genet. 1996;58:271-80. 13. Roa BB, Boyd AA, Volcik K, Richards CS. Ashkenazi Jewish population frequencies for common mutations in BRCA1 and BRCA2. Nat Genet. 1996;14:185-7. 14. Struewing JP, Abeliovich D, Peretz T, Avishai N, Kaback MM, Collins FS, et al. The carrier frequency of the BRCA1 185delAG mutation is approximately 1 percent in Ashkenazi Jewish individuals. Nat Genet. 1995;11:198-200. 15. Abeliovich D, Kaduri L, Lerer I, Weinberg N, Amir G, Sagi M, et al. The founder mutations 185delAG and 5382insC in BRCA1 and 6174delT in BRCA2 appear in 60% of ovarian cancer and 30% of early-onset breast cancer patients among Ashkenazi women. Am J Hum Genet. 1997;60:505-14. 16. Mullineaux LG, Castellano TM, Shaw J, Axell L, Wood ME, Diab S, et al. Identification of germline 185delAG BRCA1 mutations in non-Jewish Americans of Spanish ancestry from the San Luis Valley, Colorado. Cancer. 2003;98:597-602. 17. Schorge JO, Mahoney NM, Miller DS, Coleman RL, Muller CY, Euhus DM, et al. Germline BRCA1-2 mutations in non-Ashkenazi families with double primary breast and ovarian cancer. Gynecol Oncol. 2001;83:383-7. 18. Osorio A, Robledo M, Albertos J, Diez O, Alonso C, Baiget M, et al. Molecular analysis of the six most recurrent mutations in the BRCA1 gene in 87 Spanish breast/ovarian cancer families. Cancer Lett. 1998;123:153-8. 19. Jara L, Ampuero S, Santibanez E, Seccia L, Rodríguez J, Bustamante M, et al. BRCA1 and BRCA2 mutations in a South American population. Cancer Genet Cytogenet. 2006;166:36-45. 20. Jara L, Ampuero S, Seccia L, Bustamante M, Blanco R, Santibanez E, et al. Frequency of the 185delAG mutation in the BRCA1 gene in Chilean healthy women with family history of breast cancer. Rev Med Chil. 2002;130:1113-23. 21. Backe J, Hofferbert S, Skawran B, Dork T, Stuhrmann M, Karstens JH, et al. Frequency of BRCA1 mutation 5382insC in German breast cancer patients. Gynecol Oncol. 1999;72:402-6. 22. De Benedetti VM, Radice P, Pasini B, Stagi L, Pensotti V, Mondini P, et al. Characterization of ten novel and 13 recurring BRCA1 and BRCA2 germline mutations in Italian breast and/or ovarian carcinoma patients. Mutations in brief Nº 178. Hum Mutat. 1998;12:215. 23. Tommasi S, Crapolicchio A, Lacalamita R, Bruno M, Monaco A, Petroni S, et al. BRCA1 mutations and polymorphisms in a hospital-based consecutive series of breast cancer patients from Apulia, Italy. Mutat Res. 2005;578:395-405. 24. van Der Looij M, Wysocka B, Brozek I, Jassem J, Limon J, Olah E. Founder BRCA1 mutations and two novel germline BRCA2 mutations in breast and/or ovarian cancer families from North-Eastern Poland. Hum Mutat. 2000;15:480-1. 25. Dufloth RM, Carvalho S, Heinrich JK, Shinzato JY, dos Santos CC, Zeferino LC, et al. Analysis of BRCA1 and BRCA2 mutations in Brazilian breast cancer patients with positive family history. Sao Paulo Med J. 2005;123:192-7. 26. Torres D, Rashid MU, Gil F, Umana A, Ramelli G, Robledo JF, et al. High proportion of BRCA1/2 founder mutations in Hispanic breast/ovarian cancer families from Colombia. Breast Cancer Res Treat. 2007; 103: 225-32. 27. Brose MS, Rebbeck TR, Calzone KA, Stopfer JE, Nathanson KL, Weber BL. Cancer risk estimates for BRCA1 mutation carriers identified in a risk evaluation program. J Natl Cancer Inst. 2002;94:1365-72. 28. Ford D, Easton DF, Bishop DT, Narod SA, Goldgar DE. Risks of cancer in BRCA1-mutation carriers. Breast Cancer Linkage Consortium. Lancet. 1994;343:692-5. 29. Struewing JP, Hartge P, Wacholder S, Baker SM, Berlin M, McAdams M, et al. The risk of cancer associated with specific mutations of BRCA1 and BRCA2 among Ashkenazi Jews. N Engl J Med. 1997;336:1401-8. 30. Thompson D, Easton DF. Cancer Incidence in BRCA1 mutation carriers. J Natl Cancer Inst. 2002;94:1358-65. 31. Miller SA, Dykes DD, Polesky HF. A simple salting out procedure for extracting DNA from human nucleated cells. Nucleic Acids Res. 1988;16:1215. 32. Elstrodt F, Hollestelle A, Nagel JH, Gorin M, Wasielewski M, van den Ouweland A, et al. BRCA1 mutation analysis of 41 human breast cancer cell lines reveals three new deleterious mutants. Cancer Res. 2006;66:41-5. 33. Kutner SE. Breast cancer genetics and managed care. The Kaiser Permanente experience. Cancer. 1999;86:2570-4. 34. Ikeda N, Miyoshi Y, Yoneda K, Shiba E, Sekihara Y, Kinoshita M, et al. Frequency of BRCA1 and BRCA2 germline mutations in Japanese breast cancer families. Int J Cancer. 2001;91:83-8. 35. Peto J, Collins N, Barfoot R, Seal S, Warren W, Rahman N, et al. Prevalence of BRCA1 and BRCA2 gene mutations in patients with early-onset breast cancer. J Natl Cancer Inst. 1999;91:943-9. 36. Ruiz-Flores P, Calderón A, Barrera-Saldaña H. Breast Cancer Genetics BRCA1 and BRCA2: Main susceptibility genes. 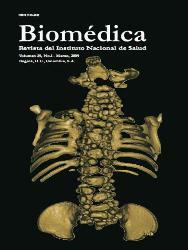 Revista de Investigación Clínica. 2001;53:46-64. 37. Trincado P, Fardella C, Mayerson D, Montero L, O’Brien A, Barrueto K, et al. Prevalence of the 185Ag deletion of the BRCA1 gene in Chilean women with breast neoplasm. Rev Med Chil. 1999;127:19-22. 38. Jara L, Ampuero S, Seccia L, Bustamante M, Blanco R, Ojeda JM. Analysis of 5382insC (BRCA1) and 6174delT (BRCA2) mutations in 382 healthy Chilean women with a family history of breast cancer. Biol Res. 2002;35:85-93. 39. Mantilla A, Vesga B, Insuasty J. Registro de Cáncer, Unidad de Oncología, Hospital Universitario Ramón González Valencia, Bucaramanga, Colombia. (1996-1999). MedUNAB. 2006;9:14-9.
not attributable to BRCA1 or BRCA2 mutations: differences from breast carcinomas arising in BRCA1 and BRCA2 mutation carriers. Clin Cancer Res. 2003;9:3606-14. 41. Easton DF, Pooley KA, Dunning AM, Pharoah PD, Thompson D, Ballinger DG, et al. Genome-wide association study identifies novel breast cancer susceptibility loci. Nature. 2007;447:1087-93. 42. U.S. Preventive Services Task Force (USPSTF). Genetic risk assessment and BRCA mutation testing for breast and ovarian cancer susceptibility: recommendation statement. Ann Intern Med. 2005;143:355-61. 43. Stoppa-Lyonnet D, Laurent-Puig P, Essioux L, Pages S, Ithier G, Ligot L, et al. BRCA1 sequence variations in 160 individuals referred to a breast/ovarian family cancer clinic. Institut Curie Breast Cancer Group. Am J Hum Genet. 1997;60:1021-30.